The Residenzplatz is a representative square in Baroque style at the historic heart of Salzburg′s Altstadt (Old Town), extending between the Salzburger Dom cathedral on one side, and the Residenz (Bishop′s Palace) and the Neue Residenz (New Bishop′s Palace) and a row of Medieval burgher houses on the others. The Residenzplatz is outlaid in a rather splendid fashion, which hints at its purpose of impressing visitors of the Prince Archbishop of Salzburg, who resided at the Residenz as a sort of Bill Gates of his day (with political and religious powers rather than CEO powers, that is – only financially, they have things in common). The origins of the Residenzplatz go back to the late 16th century. In 1587, Prince Archbishop Wolf Dietrich von Raitenau – the father of the Baroque face of Salzburg – decided to get rid of some of the city′s narrow medieval lanes and get nice, wide piazzas instead. He had grown up in Rome at a time when the city was revamped extensively and upgraded to the Renaissance and Baroque masterpiece we know today. Wolf Dietrich von Raitenau liked this new style and wanted to establish it in Salzburg, the wealthy principality south of Bavaria. 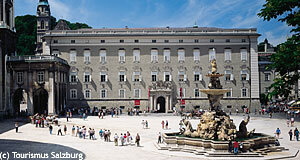 His building projects were to alter the face of Salzburg more than any other single construction period. In the case of the Residenzplatz, he demolished 55 burgher houses and a cemetery. When you get to the Residenzplatz, you will immediately be drawn to the main attractions, most importantly the Residenzbrunnen, the biggest Baroque fountain of its kind outside of Italy. This is all well (note the sophisticated play on words – as non-native speakers we are quite proud of that), and the intention of the people who planned the Residenzplatz. However, there are also some details worth noting that most travel guides and even tour guides will forget about. For example the burgher houses at the Residenzplatz. The house of Residenzplatz 2 has late Gothic window frames from about 1500; they were discovered and exposed only in 1930. In 1693, the famous Baroque painter Johann Michael Rottmayr lived here during an assignment in the Residenz Palace. To see one of Rottmayr′s frescos free of charge, go to the Dreifaltigkeitskirche (Trinity Church). The house Residenzplatz 3 has in noteworthy Baroque portal. House number 4 has a façade worth noting, dating back to the late 17th century. Note also a little painting depicting the holy family fleeing to Egypt at house number 5; the depiction dates back to the 18th century. Note also this house′s iron gate. Finally, a few more words on the main attraction, the Residenzbrunnen. This biggest Baroque fountain of Central Europe was built between 1656 and 1661 under the rule of Prince Archbishop Guidobald von Thun. The material used is marble from Mount Untersberg. The artists in charge were Tommaso di Garona and Antonio Dario. The fountain is divided into several distinct sections: The base is formed by four sea horses that surround a central rock covered in marine animals and plants; this rock carries four men that in turn carry a bowl. In this bowl, there are three dolphins which carry the final level, a bowl in which Triton is holding the shell of a snail at the top. For details, have a look at our photo gallery – there you will find several depiction of the Residenzbrunnen. Originally, the engineers in charge with the construction of the Residenzbrunnen wanted to use the water from the main canal of Salzburg, transporting water from Fürstenbrunn at the Untersberg mountain. This proved not to work well (here we go again…) and in 1692, the fountain was connected with the water supply of Hellbrunn via the Hofbrunnhaus in the Nonntal district (not far from the so-called Henkershäuschen or "hangmen′s house"). Only in 1962, the Residenzbrunnen was connected to the main water supply network of Salzburg, which uses primarily water from the Untersberg – just as intended by the Baroque builders of the Residenzbrunnen.